This year’s championship, on April 19th, continued an unwelcome trend of unseasonably rough weather threatening the contest site. The worst winter in many years was funneling two distinct cold fronts toward Florida. Sandwiched between them was a three-day pocket of good weather which may or may not arrive during the Easter Surfing Festival weekend. Race organizers and competitors alike consulted their favorite weather forecast sites hoping to divine the outcome on race day. Ultimately the weather gods were kind, and contestable, although challenging, conditions came through. Fifty paddlers were greeted by reasonably calm conditions and chest high surf. 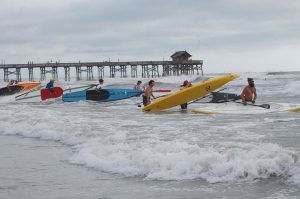 The event had the highest number yet of open paddle craft, including five surfskis, three single outrigger canoes and two two-person outriggers. A beach start was chosen and canoes and surfskis charged through the surf first, followed by traditional paddleboards and stand up paddleboards. Although some competitors were rolled by the rollers, everyone made it to the outside in one piece. The 7-mile course included a 1.6-mile upwind leg south from the pier to Sidney Fisher Park, then a 3.5-mile downwind leg past the pier to Cheri Down Park and upwind 1.8 miles to finish at the Cocoa Beach Pier. The finish was exciting and chaotic as paddlers surfed their craft to the finish line through surfers, skimmers, and clots of swimmers. Nationally ranked surfskier, Reid Hyle once again left the pack of Open Paddlecraft far behind with a great 00.57.06 minute finish. Local paddler Kieran Grant was first in men’s 14 ft. SUP with a time of 01:21:25.33. Kristen Apotsos, from Melbourne Beach, finished first in women’s Open SUP with a time of 01:40:10. Connor Rush, of Orlando, finished first in the Junior SUP division with a time of 01:58:30.62. Greg Shmidt, Dan Prosser and Cynthia Aguilar posted first place finishes in their respective Traditional Paddleboard divisions. All of this year’s athletes deserve congratulations for rising to the challenge of the day and turning in outstanding performances. We are grateful for the support of our sponsors: Paddlesurf Mermaid, Bend Over Baby fishing gear, Paddleboard House, Seatow, and SOBE Surf. And as always, none of this would be possible without our volunteers. Thank you for your hard work and dedication. Full race results: https://paddleguru.com/races/FloridaStatePBChampionship. Paipo: Prone to Ride – Get yourself over to the museum for a look at our new exhibit. At the opening on Easter Weekend, Rod Rodgers, the undisputed guru of Paipo surfing, gave us an enthusiastic mini-history of the Paipo branch of the surfing tree. The exhibit is colorful and full of information you didn’t know you didn’t know. 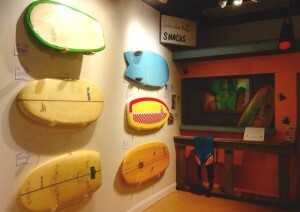 Meanwhile, the Pat O’Hare exhibit is also still running, which features boards Pat has shaped over 50 years, as well as a video interview with the man himself. Kelly Slater memorabilia rounds out the current offerings. Upcoming – Waterman’s Challenge and Luau – June 6-8 – International Palms and Cocoa Beach Pool Pavilion. Get ready for another full weekend of surfing, sunning, eating and hula-hula! Registration June 6, surfing and Luau on June 7 and more surfing on June 8. In addition to traditional surf categories, enjoy specialty events like the Rodeo,Vintage, paddleboard race, SUP, body board and team events. This year, even the most newby Menehunes will get to shine in the “push-in.” Almost as much fun for the spectators as the competitors! Watch for details on our website.